As I mentioned the other day, I am always looking for new appetizers. 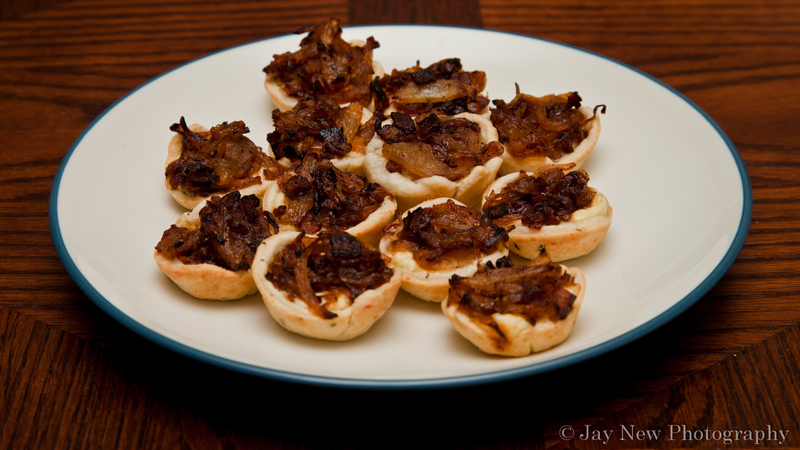 After making the Bacon Basil Tarts, I was hooks! The best part is that they are so small, you can easily make a variety of types of tarts and the best part: you can eat each one! So far, I have two variations, from the original recipe. I plan to make many more, so be prepared for quite a few tart recipes. The crusts are the same but the fillings are different. This recipe has a cheesy filling which is topped by caramelized onions and bacon. Give it a try and tell me what you think! I love creamy, salty, sweet combos 🙂 I hope you try this and enjoy it! Cheese, bacon and caramelized onions? The combination sounds out of this world! With its petite sizes, i might have to go for seconds for this. 🙂 Love small bites of foods. You get to try a variety and not feel so guilty lol 🙂 Have a wonderful day!